Hurry! Email subject line tips for law firms … WHILE SUPPLIES LAST! Did that headline get your attention? Statistically speaking, it should have. It’s got a lot of exclamation points, an implied sense of urgency and, to top it all off, some text written in all-caps. On the other hand, it does seem a little desperate, as if it’s screaming for your attention like a toddler in the middle of the toy aisle. But even though we all probably get a little annoyed with the deluge of promotional emails and e-newsletters we receive, this vehicle is still a critical part of any law firm’s legal marketing program. As long as you are using your e-newsletter to provide information that is useful to your audience (and not just puffery that promotes your firm), you’ve got a legal marketing asset that can’t be beat. Just as long as people actually read the darn things. So, how do we get people to read the darn things? As any experienced law firm email marketing specialist can tell you, subject lines play a huge role. In fact, according to a report by Chadwick Martin Bailey, 64 percent of people say they open an email because of a subject line. 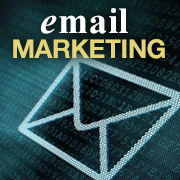 The following are some statistics that will help you compose effective email subject lines. “Alert” is better than “Report” – According to a study by UK marketer Adestra, B2B marketers are better off providing highly timely information in their e-newsletters. Words like “Alert” and “Breaking” showed about a 33-percent increase in open rates above the average. Words like “Reports” and “Forecasts” had the opposite effect, reducing the open rate by about 32 percent. Urgency is important – Creating a sense of urgency in law firm email marketing is important, particularly if you are trying to incite your readers to take action, such as registering for an upcoming conference or webinar. The words you use to create urgency matter significantly. According to the Adestra report, “Don’t Miss” was the only phrase that had a positive open-rate correlation, resulting in a 6.3-percent increase in opens and 40-percent increase in click-throughs. According to a report by email marketing solutions provider MailChimp, the word “Urgent” receives a high response rate as well. Size matters – Bigger is not always better, especially when it comes to email marketing subject lines. Studies have consistently shown that subject lines that contain fewer characters lead to higher open rates. As a rule of thumb, try to keep your subject lines under 50 characters. In fact, a 2012 report from Adestra saw a 58-percent open rate for subject lines with fewer than 10 characters. To UPPERCASE or not to uppercase – You would think that writing in all caps would result in significantly higher open rates. But also according to the MailChimp study, using the Internet equivalent of yelling has a minimal impact, resulting in an open-rate increase of about 7 percent. Conversely, capitalizing at least one word showed practically no change in open rates from the average. Should you make it personal? – There is some discrepancy in the data on this one. First, to explain, most email marketing software enables users to automatically personalize messages so it includes an individual’s name in the email copy and/or subject line. This, of course, depends on how organized and complete your recipient database is. Given that you have the ability to do this, should you? According to most reports, yes. Adestra reports that personalization among B2B companies results in an 18.3-percent increase in opens. MailChimp’s study asked this question but parsed its information out by industry. The result? Surprisingly, the legal industry was the only market in which personalization hurt open rates, decreasing overall opens by 31 percent. Is this unique to the legal industry or is it, perhaps, representative of a poor data set on MailChimp’s part? It’s important to remember that law firm email marketing is just as much an art as it is a science. So while we can rely on statistics and charts to guide our strategies, we can never predict the success of a campaign. Also, audiences do quickly become desensitized to certain tactics, so a good rule of thumb is to regularly mix up your approach. Finally, you should also keep in mind that opens and click-throughs are not the ultimate goal of an email marketing campaign. These are just metrics that help you get insight into how your audience is interacting with your content. The real tests are how much engagement you are generating, how much new business you are creating and how much trust you are building within the marketplace. If you have any additional law firm email marketing subject line tips, post them below or send them to Terry M. Isner at tisner@jaffepr.com.